These Cities Are Getting Poorer — But Are They Affordable to Live? See whether these cities are actually affordable to live in. There was a time in this country when cities like Buffalo, N.Y., Cleveland and Detroit were capitals of industry. Companies in those cities employed tens of thousands of workers in automotive and manufacturing while paying good wages. That was a long time ago, however, and since then these great cities and many others like them have fallen into serious decline, losing residents and money. GOBankingRates conducted a study to determine which U.S. cities used to rank among the most prosperous but have since become some of the poorest. Factors include the change in individual income from 1970 to 2016, the change in household income, the change in population and the change in poverty rate. Click through to learn if these cities’ failing fortunes is also making them more affordable places to live. The cities that used to be rich and are now poor have a lot in common: Detroit; Cleveland; Dayton, Ohio; Rochester, N.Y.; Trenton, N.J.; and Buffalo all used to be major centers of industries like manufacturing and automotive production. Since the early 1970s, these industries have declined dramatically. The fallout can be seen in the fall in population and wages, as well as the rise in poverty and ever-worsening income inequality. All except one of the 15 cities in the study experienced an outright decline in population from 1970 to 2016 — Providence, R.I. is the lucky winner with a population that has increased by 103 people in 46 years. Detroit’s population plunged by nearly 1 million people, by far the worst. Cleveland suffered badly, dropping more than 365,000 people — essentially half its population — since 1970. But as depressing as these numbers are, they’re not as unsettling as the absolute decline in incomes. In 1970, the median household income in Detroit was $34,972. By 2016, despite nearly 50 years of inflation and economic changes, incomes plummeted, down to a barely sustainable $26,249. Cleveland incomes were mauled as well, falling around $5,800. Dayton, Hartford, Conn. and Newark, N.J. are the other three cities where wages have fallen absolutely. Rising poverty rates are equally unnerving. The national trend has been one of steady increase, but in these 15 cities, the growth rates are astronomical. In 1970, all cities in the top 10 ranking had levels of poverty below 10 percent. By 2016, poverty had grown to engulf more than 27 percent of households in each city. In Detroit, for example, the poverty rate surged from 8.5 percent to 39.4 percent. These cities have gotten poorer, but does that mean they’re cheap to live in? The monthly rent for an average home in the U.S. is $1,452, according to Zillow. In nine out of the top 10 cities in the study, the median rent is less than that, but the level of affordability varies a lot. For example, the four cities of the “old” Midwest all boast rents below $1,000: $730 in Dayton, $750 in Detroit, $795 in Toledo and $859 in Cleveland. 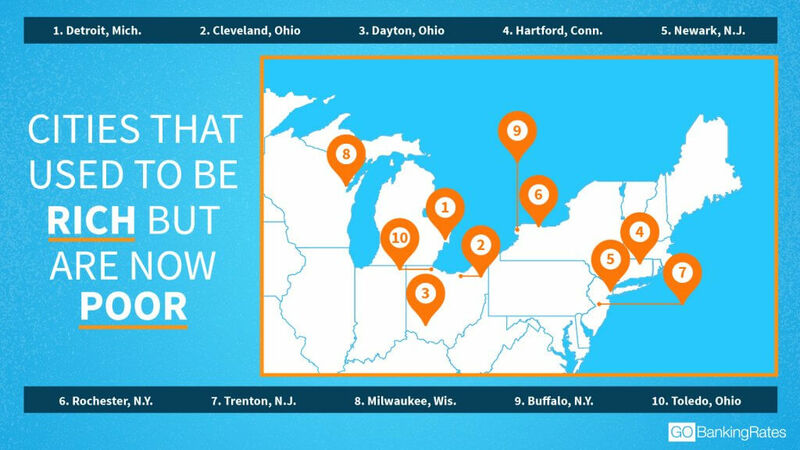 On the other hand, the poor cities of the northeast aren’t as cheap. In Trenton, the average rent is over $1,200; in Hartford, almost $1,400; and in Newark, it costs $1,503, which consumes roughly 55 percent of the median household income per month. Click through to see which poor cities are now rich. Methodology: GOBankingRates determined which U.S. cities used to be rich and are now poor by analyzing 82 major cities in terms of the following factors: (1) per capita income in 1970, per capita income in 2016, and change over time; (2) median household income in 1970, median household income in 2016, and change over time; (3) population in 1970, population in 2016, and change over time; (4) poverty rate in 1970, poverty rate in 2016, and change over time, all sourced from the U.S. Census Bureau. All information in this article is accurate at the time the study was conducted in July 2018. GOBankingRates > Making Money > Economy > These Cities Are Getting Poorer — But Are They Affordable to Live?